A MARKETING automation platform is a powerful tool with the potential to generate more leads, streamline marketing processes, and grant greater insight into the buying cycle. In fact, Gleanster reported that an astounding 79% of top performing companies had been using marketing automation for 2 years! If it’s so great, why do some companies claim that it doesn’t work for them? While the tool is powerful, it requires a person who knows how to use it. 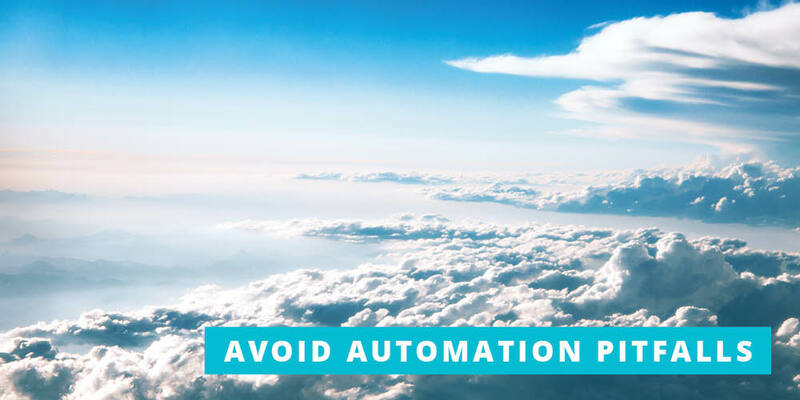 To help you get the most out of all marketing automation has to offer, here are 9 common pitfalls and how to avoid them. Marketing tools cannot work without the proper framework, and that’s something that a lot of companies overlook. You need to have a well-planned strategy, a team of trained users onboard who have access to the system, and a workflow procedure you are going to follow. This is where you’ll nail down what features of the tool you’ll use, how they will fit together, and what content you will need for each channel. Pardot offers some helpful advice here on planning for success. You need to plan your workflow. Do you have a plan to ensure all tasks get completed? Do you have a clear idea of who will manage each channel? Every employee that will work with the automation tool needs access to it and proper training on how the system works. The quality of your lead data is key to increasing conversion rates. If you’re collecting too much, not enough, or the wrong data, you are missing out on sales. This is a serious pitfall. Obviously, you will need to collect the customer name, address, and email address, but the more valuable information you collect, the more you can segment your audience and personalize messages. Consider collecting information on demographics such as age, gender, and profession. Furthermore, it can be helpful to offer drop-down menus asking what customers are interested in and what company they work with. However, keep in mind that asking too much information can reduce effectiveness. Unbounce reported that a company named Imagescape actually increased conversion by 120%, just by cutting down the fields on their lead from 11 to 4. You need to find the balance that’s right for your company. Tip: A/B testing can be helpful to find that balance. While it might be very tempting to launch an all-out marketing campaign with your new tool in place, tests should be conducted on small focus groups in the initial stages to work out any kinks in your strategy, work flow, or content. Not testing before launching a full-pledged campaign is a big pitfall. Think of it like testing a self-tanning product on a patch of skin first to see if you have any adverse effects from using the product. You wouldn’t blindly just cover your whole body in an unfamiliar product and take the risk of turning out bright orange or with an allergic reaction. The same principle applies to your testing phase with the new marketing tool. Once you’ve established that your marketing campaign shows signs of growth or improvement, you can go ahead and expand the campaign to a larger portion of your database. Next up, we will debunk the idea that marketing automation is an auto-pilot tool. If you think that the tool will help you play a less active role in the marketing process, you’re headed straight for this pitfall. While your marketing tool can solve many inbound marketing challenges, it’s not something that you can just set up and then forget about; trusting the tool to do all the work for you. Tracking performance with the available analytics and continually improving your strategies is essential if you want to get the most out of your marketing automation tool. The time you spend improving and perfecting your campaign is valuable because it helps you to better meet the needs of customers at different stages of the buying cycle. Fitting all the pieces of your new marketing tool together might not be an instantaneous solution, but rather a slow and steady approach to perfection. Next up is the pitfall of leaving leads hanging once you’ve gone through the trouble of getting them. Here’s some food for thought: According to Chief Marketer, roughly 33% of clients are likely to engage in long-term brand support when they receive a welcome email. That’s very worrying, seeing that The State of Marketing Automation Maturity found that up to 40% of marketer respondents never send out welcome emails to their new leads! By not sending out welcome emails, marketers are missing an opportunity to make a good first impression that can lead to a long-lasting relationship. We can’t stress this enough: You definitely don’t want to miss the opportunity to warmly welcome a new lead and get off to a good start. Guiding potential customers along the buyer’s journey to the place where they are ready to buy is essential. According to Marketing Sherpa, 79% of marketing leads don’t close due to the lack of nurturing. “Nurturing” leads can be seen in the same light as dating. You won’t just ask a random person to be your boyfriend or girlfriend the very first time you meet them. First, you get to know them, you date a little, share some information about yourself, and then finally, once there’s a mutual attraction and you can sense that spark of interest, you finally present the offer. The same goes for building the relationship with leads before trying to close the sale. You send them a welcome email, you share information that they have shown interest in, and then when the time is right, you ask for the sale. Helpful Fact: According to the Aberdeen Group, it takes an average of 10 marketing “touches” to move a buyer from a lead to a closed sale. The next pitfall is only using the marketing automation tool for emails. Did you know according to Sirius Decisions, a staggering 85% of B2B marketers who use marketing automation tools don’t feel like they’re using them to their full potential? Research gives insight into the reasons why this is the case. 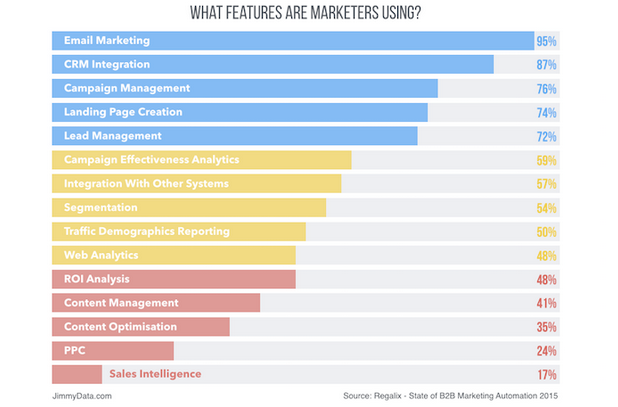 We’ve included 2015 findings from Regalix which show how often each marketing automation feature is utilized. 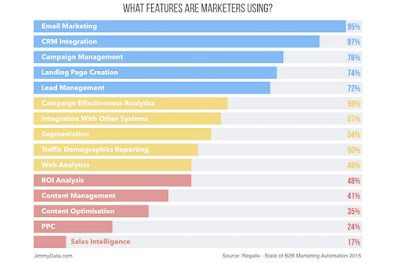 Take a look at the features that marketers are using most frequently…can you see the problem? Note that a staggering 95% of marketers use email marketing features but only 35% of them are optimizing their content. How many more leads could marketers be closing with all of their content optimized? These utilization stats are an indication of how marketers just aren’t taking full advantage of the tools they have at their disposal, which negatively impacts their results. We’re not saying that email marketing is not important. What’s critical to understand is that a marketing automation platform offers much more than just a glorified email marketing process. From PPC, to Web Analytics, to Segmentation, email marketing is just one piece of the larger marketing puzzle. Understanding your buyer’s journey will help you bridge the gap that so many other companies just cannot get across. This means you’ll have content that’s tailored to the different buying stages, delivered at the right time. Once you’ve established where most of your customers come from and what path they usually take to buying, you’ll be able to provide content that’s tailored to each step of the buyer’s journey. Understanding this journey is critical to ensure you’re sending out the right content at just the right time. Marketing automation tools are there to help you identify the journey and segment customers into groups in different stages of the buying cycle. When you don’t understand this journey, you can’t properly nurture leads towards conversion, which means leads get lost. Pitfall! While your marketing automation tool does have serious targeting capabilities, it’ll go to waste if you don’t have the right content. They don’t say content is king for no reason. Having enough great content ensures your marketing automation tool has the backbone to ultimately lead to success. You also don’t just need the quantity, you also need quality, very good quality. Make sure you’ve established your buyer personas, and that you’re catering to what it is they’ll want to hear about. You also want to ensure that you don’t have gaps in your content; otherwise, you’ll have a hard time getting prospects all the way through the sales funnel. Tip: Producing fewer articles that are more relevant to your target market is always more important than cramming your site full of useless and irrelevant information. Quantity can simply never replace quality, and Google agrees! Now that you know 9 of the biggest pitfalls marketers make when using a marketing automation tool, you can avoid them! Used properly, your marketing automation tool can help you grow your business beyond what would otherwise be possible. Join the 79% of top companies already reaping the benefits of this technology and watch your business grow.